This is a partial preview. Full document is 114 pages. View large preview. This road-map document condenses the top notch methodology that will produce a high caliber breakthrough strategy. 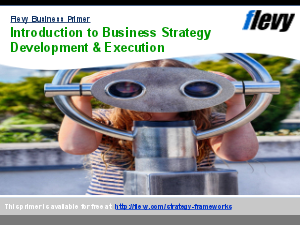 It is focused on the strategy formulation process and not on implementation of strategy as such. The document was carefully prepared to present in a comprehensive manner the key ingredients that impact the formulation phase to a high degree and that generate strategies way beyond expectations. It is equally applicable to corporate organizations but also to new SME start-ups. It is all about breakthrough and quantum leap change, and consultant is also presenting a variety of practical and powerful techniques, including very novel but tested approaches such as iterative convergence and dual team. The right mindset for strategic planning is quite elaborated in the document, as well as means of igniting innovation in the process, and generating great goals. Ample material helps in the preparation and getting started with the strategy formulation phase, including detailed steps. Who does what is also well covered with the aim of obtaining a breakthrough output. The material is intended as instrumental but also inspirational, since breakthrough strategy formulation is not only about the IQ and analysis but indeed about the entrepreneurial spirit. This road-map can be used as a support manual in any strategic planning endeavor, or as a template introduction training in connection with strategic planning and innovation. This road-map document was developed by Dr. Stephen M. Sweid, a business consultant, researcher and trainer with over 20 years consulting experience on the international scene: Europe, USA, Middle East and Far East, covering a wide spectrum of industries, including hi-tech. Consultant specializes in quantum leap strategy and innovation. What Is A Quantum Leap Change? Why The Need For Quantum Leap Approach? How To Set Main Strategic Goals Which Are Great? How Iterative Convergence Works And Its Purpose? Where Can You Demonstrate Real Tangible Differentiation? Where Do You Stand Out? Strategy Timeline: Why 3-5 Years? How Long Should Formulation Of Breakthrough Strategy Take? Strategy Development? Breakout Strategy? Total Quality Management? Or something else.